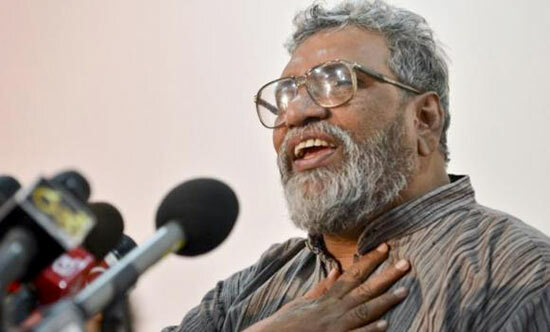 Elections Commissioner Mahinda Deshapriya informed party leaders yesterday it was not consistent with democracy to introduce a new electoral system and then conduct an election under it immediately afterwards. Commissioner Deshapriya had said so during a meeting on reforming the electoral system held at Parliament complex yesterday attended by party leaders, parliament sources told ‘The Island’. The Commissioner pointed out that the people needed at least one year to get used to a new electoral system. However, he said he and his staff would implement the new system if Parliament passed new laws to that effect. The Elections Commissioner is scheduled to present today another report to the same committee on the new electoral system and issues that might arise in its implementation. Yesterday’s meeting was attended by leaders and representatives of political parties represented in Parliament including Prime Minister Ranil Wickremesinghe. Who give a xxxt about that? When the whole idea is about staying in power as long as possible by one way or another? We need to press this forward some how before the next election, because this is the jewel of the crown called the 100 day programme, we had been telling the SL public throughout our election campaign. You do not know what you are talking about the Election Comissioner, We, the unelected government of SL, knows better than you. With independence Lankans were endowed with a government modeled under the British two tiered system and the process was similar ….the parliament (lower house) and the Senate. The members to parliament was elected by the electorate and members to the Senate was nominated by the the GG who represented the Head of State. The system worked fine until the problem of maintaining a tangible system in running the Senate and the role of GG. With time the role of the Senate becam intangible for the simple reason there were no lords and ladies and the credibility of those already there were suspect consequently the parliament held little regard for Senators and the inevitable consequence was its abolition. I think the first GG was one Soulbury and soon he was succeeded by Oliver Gunatilake and then couple of other guys and tried to live up to expectations unfortunately their loyalaty was not to the people but the party that nominated them. Then the Constitution was ‘amended’ dramatically to adopt a hybrid system of sorts the essential feature of which was the election of an executive president with as many flaws as there were Clauses. EC has donned his blinkers. Who wants to study the system and its aftermath.? We see a bull or rather a gang of bulls inside a china shop.Will they care to have enough time to stare and share? Honourable EC your concerns are suitable for a more stable atmosphere.